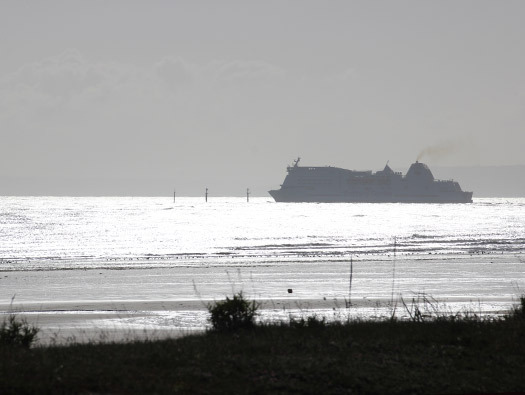 StP20 La Breche (COD), K.V.U.Gr Riva-Bella, K.V.Gr Caen. PC 10./736 Company commanded by Hauptmann Heinrich Kuhtz. 1 x R626 Casemate for a 7.5cm Pak with roof canopy under construction. 1 x 5cm ringstands Nr.1694. 1 x SK for a 3.7cm K. gun. 1 x 5cm SK/ Doppelschartenstand. 1 x Peilstand (observatory for ). 2 x Bf69 Mortar open emplacements. 1 x Ringstand type U Pz.T. FT-MG.311 tank turret. 2 x Vf/Gr. W bunker. 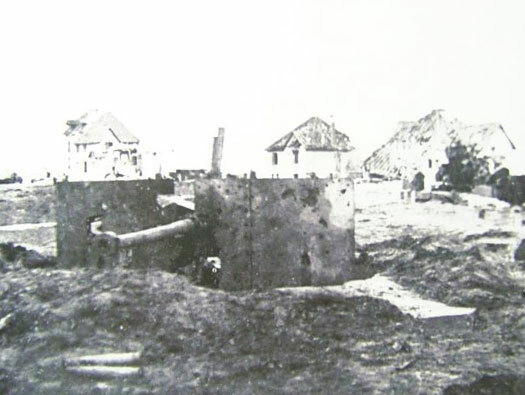 1 x 7.5cm Pak gun. 2 x 5cm KwK L/60 Pak guns. 2 x 8.14cm Gr.W278(f) mortars. StP20 was very well defended with 7.5cm Pak 40, 2 x 5cm KwK L/60 Pak's and 3.7cm K. gun. Several machine guns and two 8.14cm Gr.W.278(f) mortars. 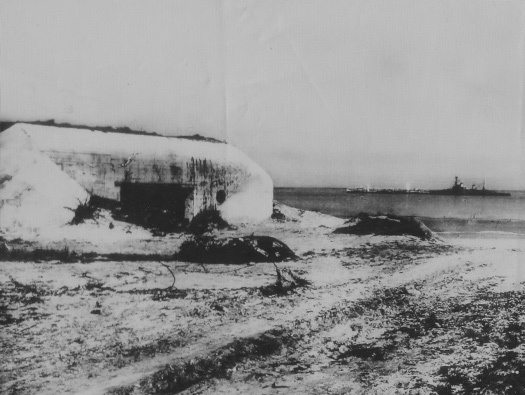 Several Vf2a bunkers, an open emplacement for a 7.5cm F.K.231(f) and 4 x Tobruks. 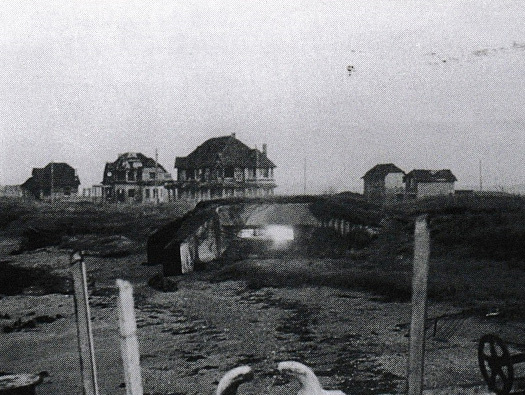 The area was laid out for pre war with new beach front housing that was in its early stages with just a road layout and only a few houses built. MG.311(f) machine gun in the FT turret. MG.311(f) machine gun in the FT turret in a U shaped Tobruk..
Defence map of the area. Making a total of 0.3 obstacles per linear yard of beach (0.3 obs. per meter). 46 x Element ‘C’ (Belgian Gates). 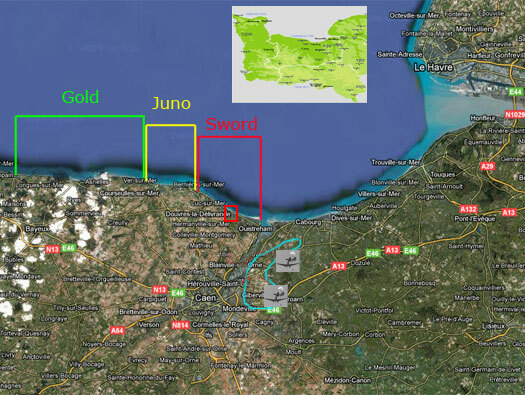 Units of the 3./736 Battalion were stationed and took the brunt of the battle for D-Day. 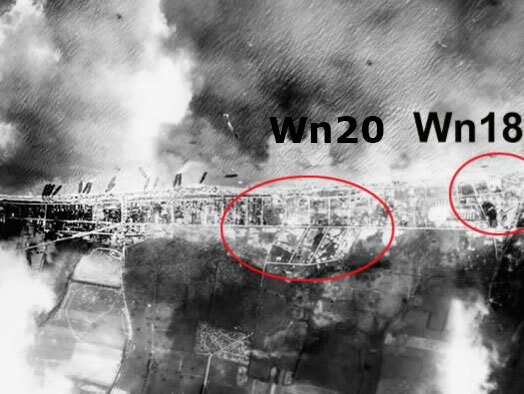 Reconnaissance air photo of StP20. Zoomed in on StP20 several positions can be seen. R677 for a 7.5cm F.K..
FT turret on a U shaped Tobruk. FT turret with an MG.311(f) machine gun. 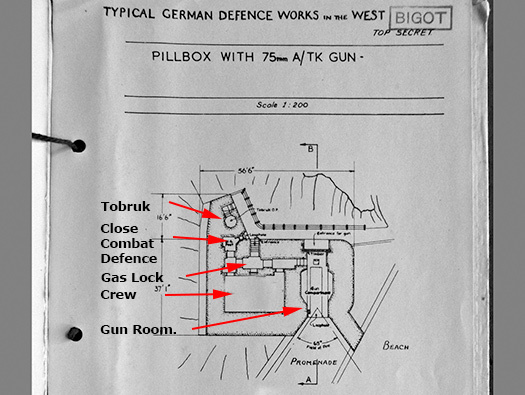 Plan where the FT U Tobruk was placed.. 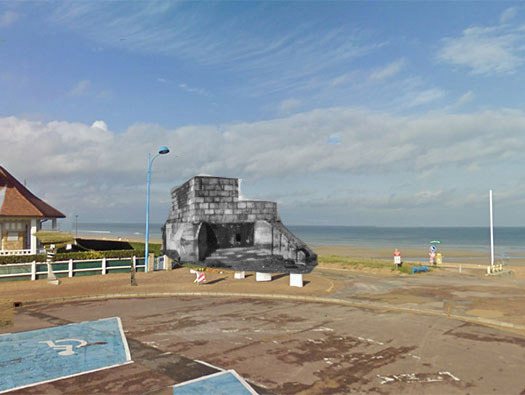 This is where I think the casemate was placed, now completely removed. A 7.5cm Pak 40 anti-tank gun was placed inside. 7.5cm Pak 40 anti-tank gun. 7.5cm Pak 40 anti-tank gun and crew. 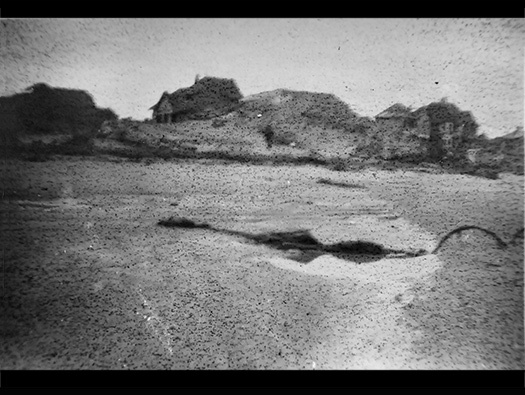 Not a very clear picture but it does show how this R677 casemate was so well camouflaged being covered in sand. 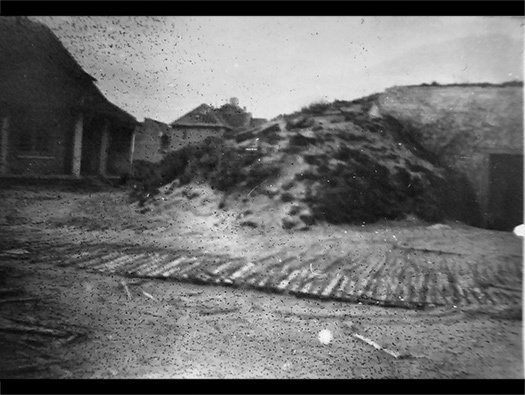 Photo taken winter of 1944, not a very good picture of the rear of the casemate. The 16 rounds that this gun managed to fire would have been deadly shots. They would have probably sunk a few landing craft and knocked out some tanks. The R677 casemate from the rear. 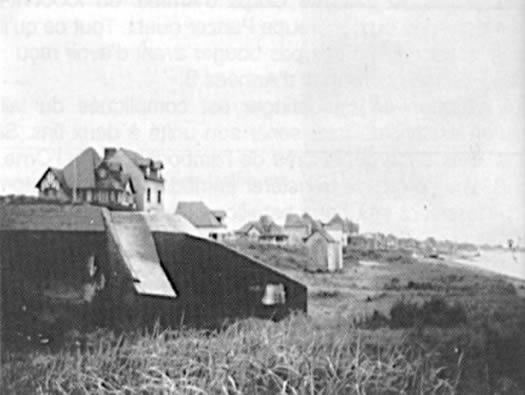 R677 casemate with a 7.5cm Pak in place. 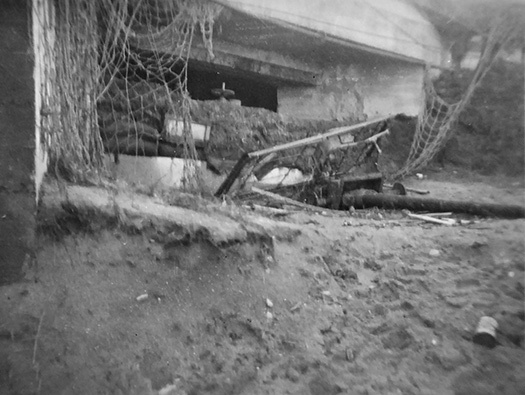 The R677 casemate from the front after capture still with a camouflage net and barbed wire in place. 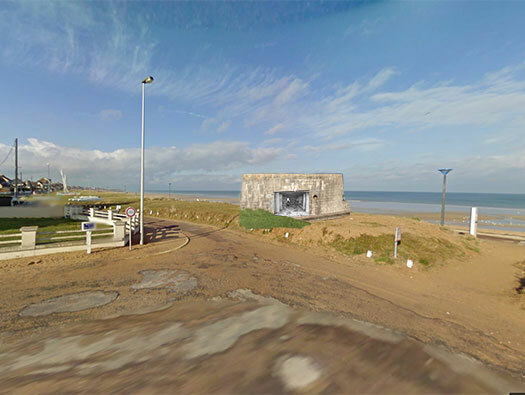 Doppelschartenstand is an interesting casemate, the 5cm KwK could turn 360° and fire down each flank but is covered on its seaward side and roofed over. 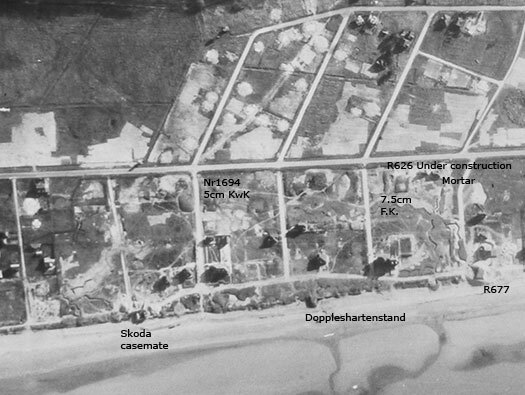 Another view of the Doppelschartenstand looking down the beach. R.F. 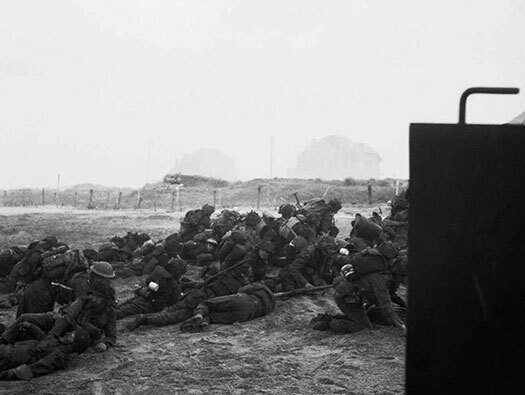 Stubbs photos Portsmouth D-Day museum archive. The 5cm KwK L/60 Pak gun can be seen blown out of the casemate and lying on the floor. You can see from this view that its a 5cm KwK gun. Red square where the Doppelschartenstand was situated and just about where the photo was taken there was a Tobruk. Another view of the Doppelschartenstand. 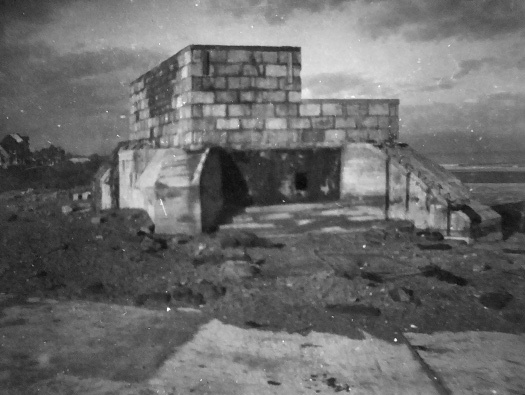 StP20 La Breche machine gun bunker camouflaged. 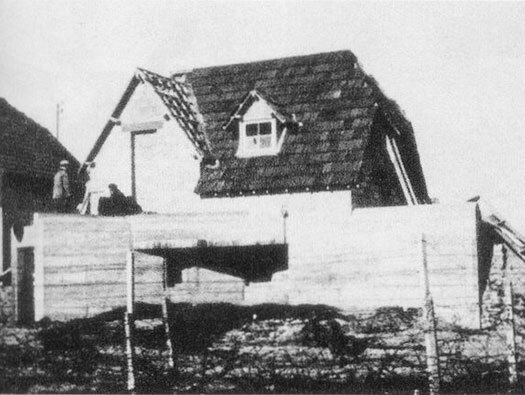 A locally builtders making this machine gun bunker to look like a house situated somewhere between Riva-Bella & Lion-sur-Mer..
German artillery fire plan to fire on an attacking force. 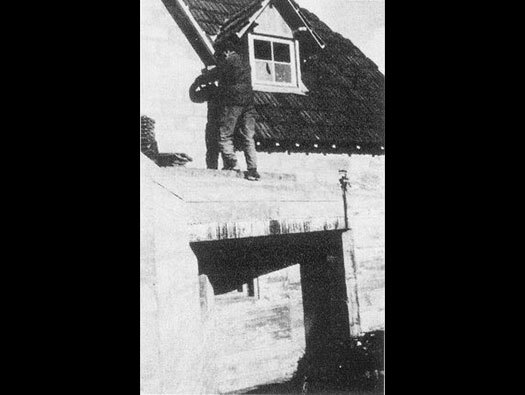 This photo was taken around December 1944 and shows the roof tiles have been removed, probably to repair a damaged house. The Germans often comandeared a house and then orderd the owners to dismantle it and the products were used in the building of new bunkers. StP20 La Breche SK/Skoda 3,7 cm K. Pak casemate. This is my interpretation of what it may have looked like. Nothing remains but I believe a Tobruk is in one of the gardens on the eater flank. But since I have found the picture below. Metal plate being fitted into a casemate. SK/Skoda 3,7 cm K. Pak casemate, how it may have looked. This is a 78P9 plate very like the one used here a 29P8. Taken I believe in the winter of 1944 showing what it actually looked like. Another picture of the casemate. Metal plate fitted into a casemate 29P8 plate. 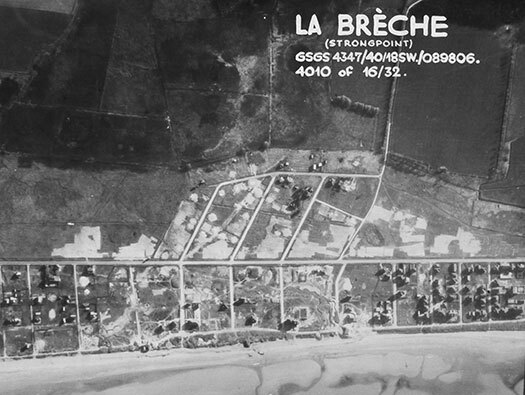 StP20 La Breche Bf69 Mortar open emplacements. 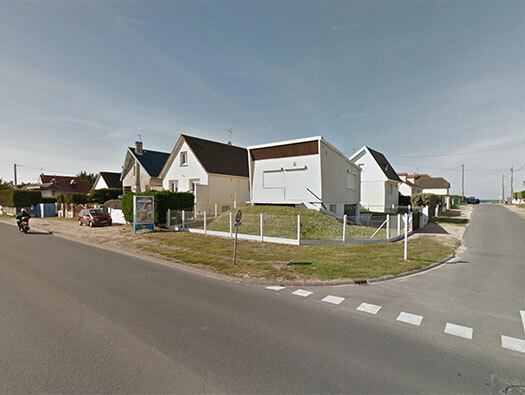 This Bf69 is at Wn31 Courseulles-sur-Mer. Just showing the type that was here. 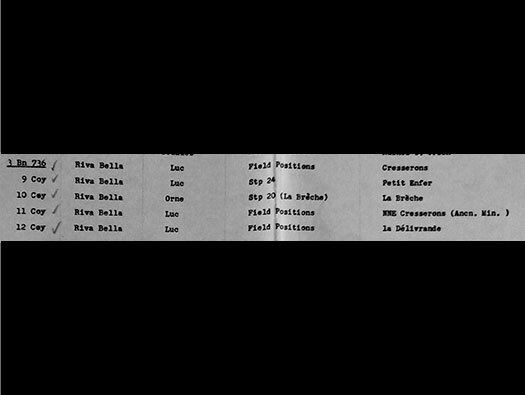 In side a Bf69 ringstand this 8.14cm Gr.W278(f) mortar and crew. 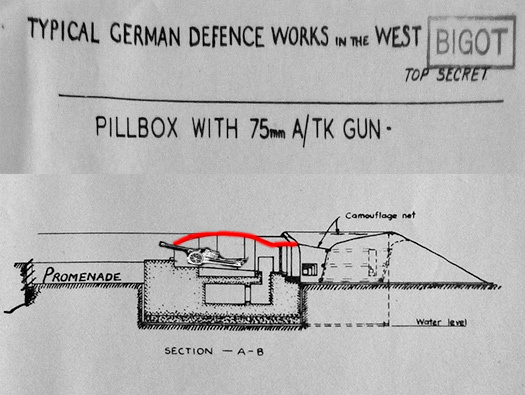 This where the 5cm KwK L/60 Pak covered the rear of the defence. Nr.1694 with the centre mounting in place..
5cm KwK L/60 in an Nr.1694. It looks as though this gun received a direct hit on its left gun shield. When a landing was in progress the artillery inland would be ordered to fire on pre arranged targets. They are RED on the map. 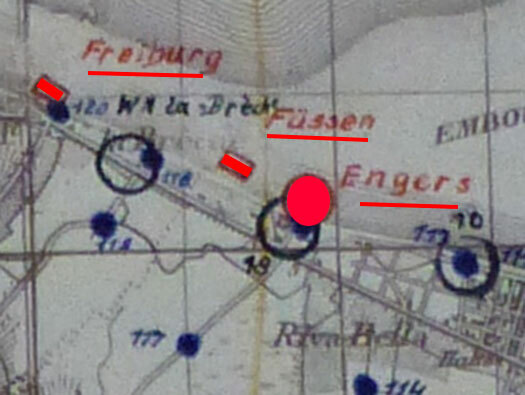 BLUE are the German positions. 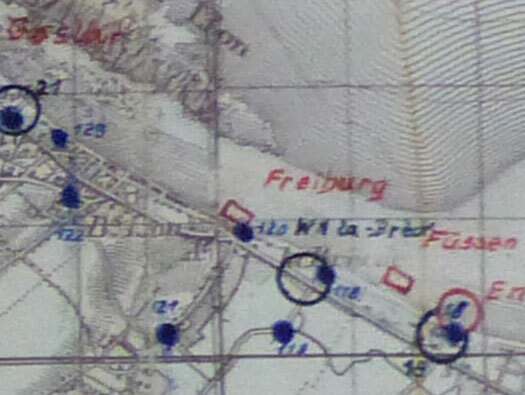 When landing craft enter the red areas on the map, the artillery spotter could call down drenching fire on these targets. Goslar, Freiburg, Füssn and Engers the drenching target areas. 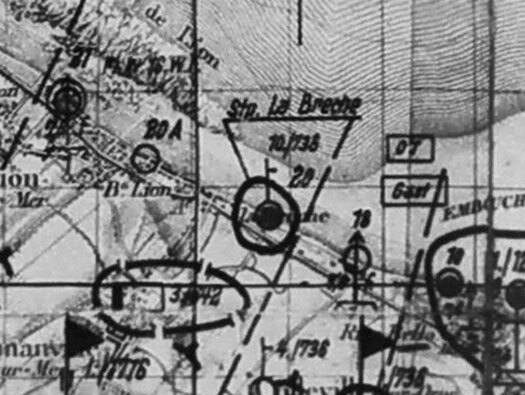 A batterie would probably fire five rounds rapid fire, so with a four gun batterie 20 shells would plaster the area. Night firing over the beach. This is the Allied Bigot map that was constantly updated right up until sailing for D-day. 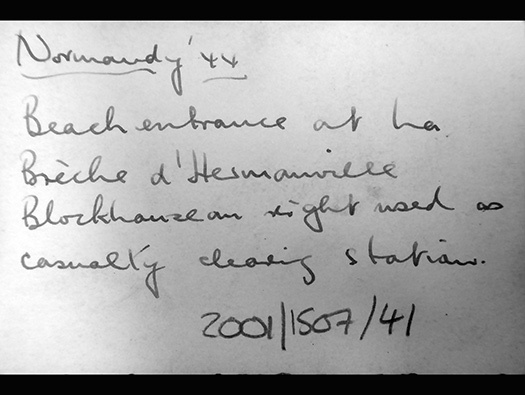 Information came in from Spies, French resistance, air photography and also British and French soldiers landing at night and searching for beach mines, sea defences, sand condition and what ever they could see and feel. Rommel checking out the defences. R626 casemate for a 7.5cm Pak 40 with roof canopy under construction. An odd bunker made of concrete but with a steel roof. R626 without a steel plate..
R626 Casemate for a 7.5cm Pak showing the steel roof section. 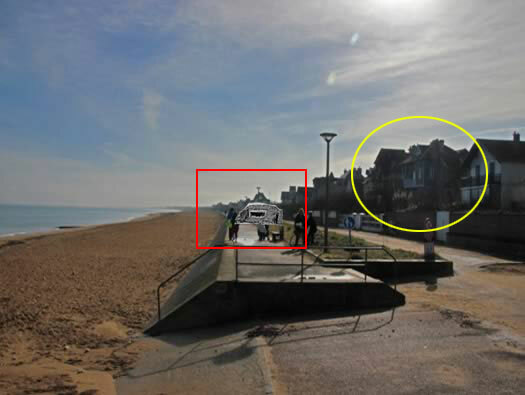 On D-Day this was Sword Beach and the 2. 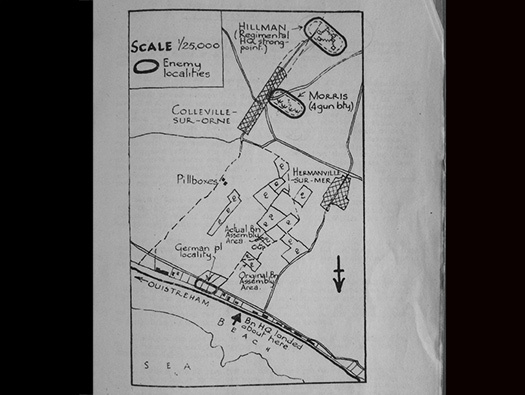 East Yorks landed here, 07.35 A & B company reported heavy opposition but the operation proceeded according to plan. The DD tanks should have landed before the infantry but due to circumstances they were late and landed just after the infantry assault. Over 30DD's made it to the beach to the astonishment of the defenders. Their floatation skirts dropped and suddenly a tank emerged. 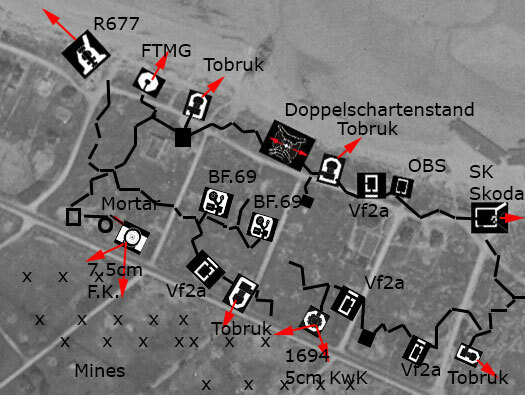 The defenders managed to take out nearly all of the DD's but a few wore down the defence and started to get off the beach and inland. Churchill AVRE on Sword Beach. 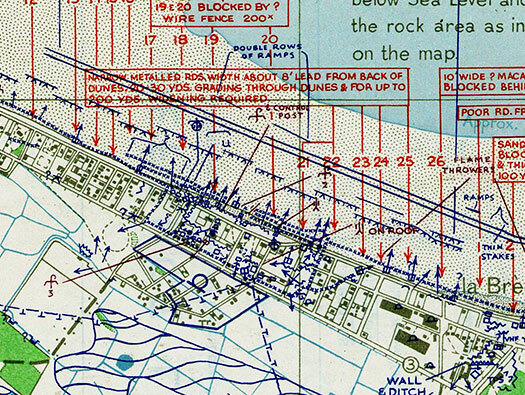 The plan of a unit that landed on D-Day showing the assembly areas and the different defences in the area..
06 June 1944 about 07:30. 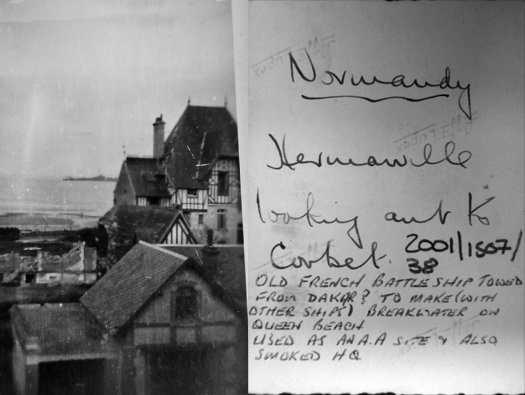 Photo taken winter of 1944, from possibly their billets on that day of the French Battleship Corbet. 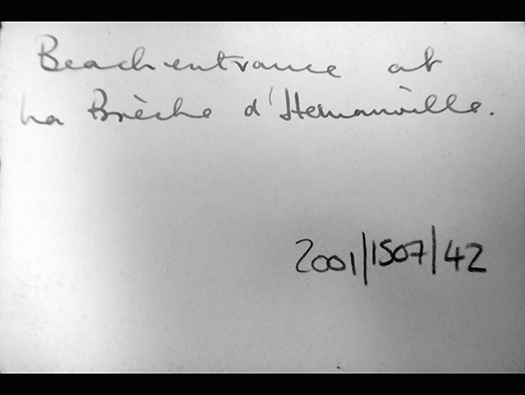 Used to defend Portsmouth in 1940, then as a barracks & naval school for Â General de Gaulle’s Free French Naval Forces. 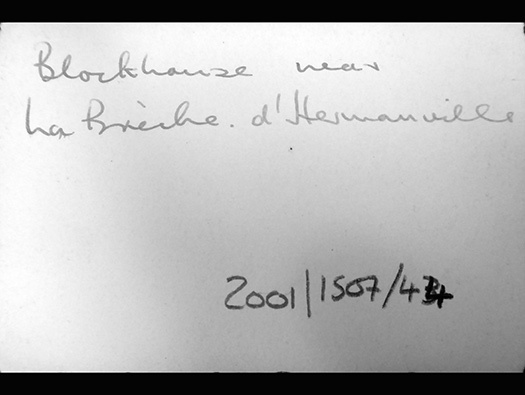 The ships commanding officer, Admiral Wietzel, sailed Le Courbet to Normandy where, at 1330 hours, proudly flying the French tricolor with the Croix de Lorraine emblem, the ship was sunk to form part of Gooseberry 5. 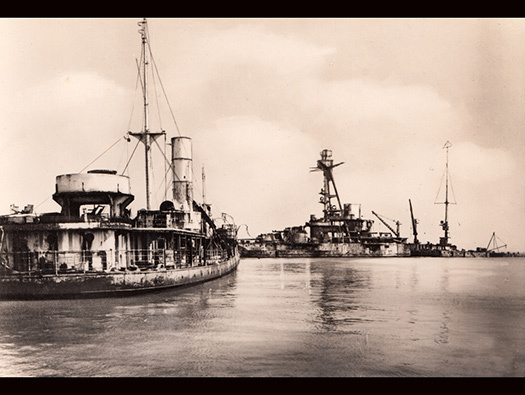 The Germans on the night of the 16th/17th August 1944 managed to torpedoed it.